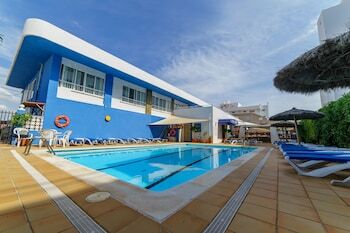 When you stay at Apartamentos Cel Blau in Es Canar, you'll be near the beach, within a 10-minute walk of Punta Arabi Hippy Market and Punta Arabi. Featured amenities include express check-in, express check-out, and luggage storage. A roundtrip airport shuttle is provided for a surcharge (available on request), and self parking (subject to charges) is available onsite. A stay at Hotel Restaurante Tio Pepe places you in the heart of Peniscola, steps from Sur Beach and Norte Beach. Self parking (subject to charges) is available onsite.